Sunday night/Monday morning The Comedy Store on the Sunset Strip. I stagger out the door, sweaty, voice ragged from cat herding, half tired and still visibly shaking from the after effects 3 cans of yerba mate too many. “So how was your night?” asks Comedy Store door guy Deric Poston. I start laughing maniacally again. I wouldn’t spend my Sunday night any other way. And if we do our job right, folks won’t be sure if we did anything at all. Please stand or take a respectful Colin Kaepernick knee! It all starts with a song, “The Official Unofficial National Anthem”. It’s not the actual national anthem. Comics with musical skills like Jeanne Whitney, Kelsey Lane, Sean Hart, Caesar Lizardo, Anna Valenzuela and more kick off the show with any song of their choice. For the most part, the rotating musical guests really bring up the audience in a roar. And right before the song reaches its peak, you can feel the energy level of that little Belly Room raise to levels of untold intensity. Erik Marino and starts, continues and repeats his spiel as more comics, new hopefuls and surprise audience start to arrive throughout the night. “And that’s how we start a show! With Talent! The bar has been set high! Who can follow that! Who can follow that! Don’t ruin my show! Who can follow this right now! Who can start my show! Any takers? Just remember when you go to sleep tonight when you have a dark night of the soul and have a crisis of conscience. Remember this moment. Remember where you had the chance and you didn’t take the chance. I want you to be funny! Welcome to Show Up Go Up LA, the most misunderstood show in comedy. And if you stay at the end of the night everyone gets a chance to work on one piece of material. I created an open mic that was fun to watch. Some people don’t like it and they’re wrong! And if you can’t survive me on a Sunday night then you can’t survive Hollywood! 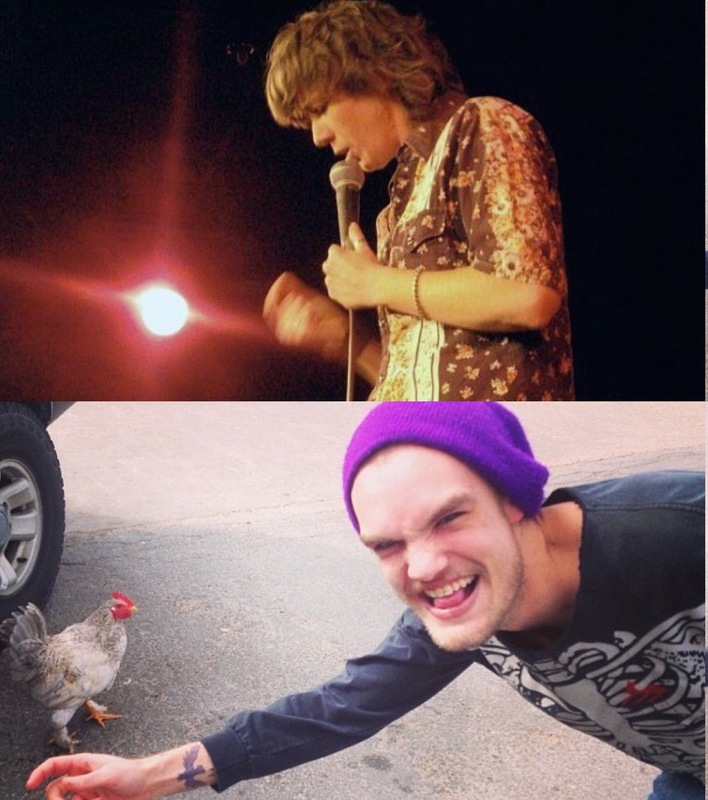 We have many ways to go on stage. We have guests, we got segments. You can even create your own segments. There are so many ways you can go up. This is the Bucket of Destiny feel free to sign a ticket and put your name in the bucket. One time only! And this is the bucket of bar tabs buy as many drinks or non-alcoholic items, a drink, chicken fingers, a Comedy Store t-shirt. It has to be a Comedy Store Receipt from today! Not a Toys R Us, 99 Cent Store receipt from God knows when! Take the sensationalism of PT Barnum, mix in 2 parts Eddie Wilson from “Eddie and the Cruisers” add multiple shots of Sam Kinison, Hunter S. Thompson and whiskey you end up with an Erik Marino. Erik’s written for television shows like ‘Ellen’ and ‘Weeds’. He was even at the Olympics in Rio with Leslie Jones. Marino was also a Groundling and even was quoted in ‘The New Yorker’ too. Say what you want about the man, he puts in his time and keeps the open mic slaughter house floor as entertaining as possible. 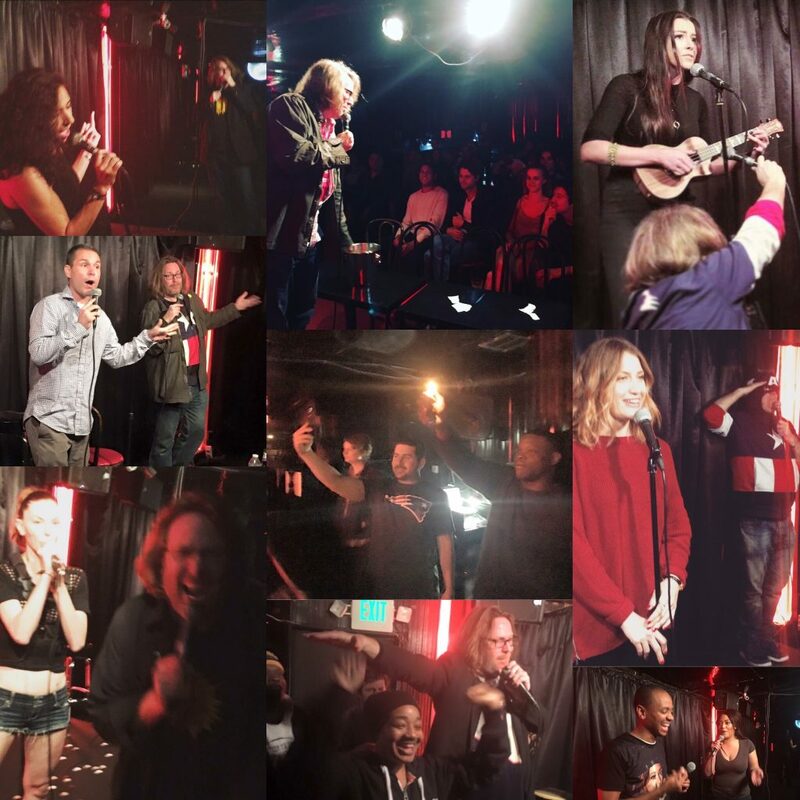 It would be easier to just run the average mutual admiration showcase of funny friends on what excluding holidays is one of the historically slower late nights of the week in the smallest room of the Comedy Store. It would much easier, but it wouldn’t be as fun. In addition to Erik Marino, Sarah Kenny and Mark Stevens on sound also keep the show on track. There’s a lot of cat herding and adult daycare involved in keeping on track. 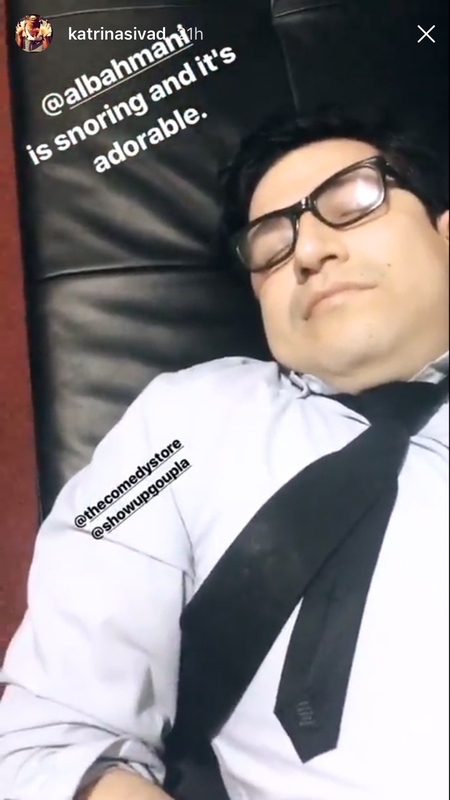 With about on average about 400 viewers on Periscope, the behind the scenes of Show Up Go Up LA at the Comedy Store has a live 1950’s television show vibe to it. There’s running to make sure performers are ready, telling folks that they’re getting bumped, setting up the room, tearing the room down, putting out ego fires, maintaining social media accounts, helping with the clean up of the room, tracking down comics again and all sorts of other fun to happen. Little things like Sarah Kenny using tickets instead of slips of paper, sign up pens with really bright tape attached to it to help remind folks not to lift the pen make a big difference. There’s a lot that goes wrong and a lot that goes right despite our best and worse efforts. 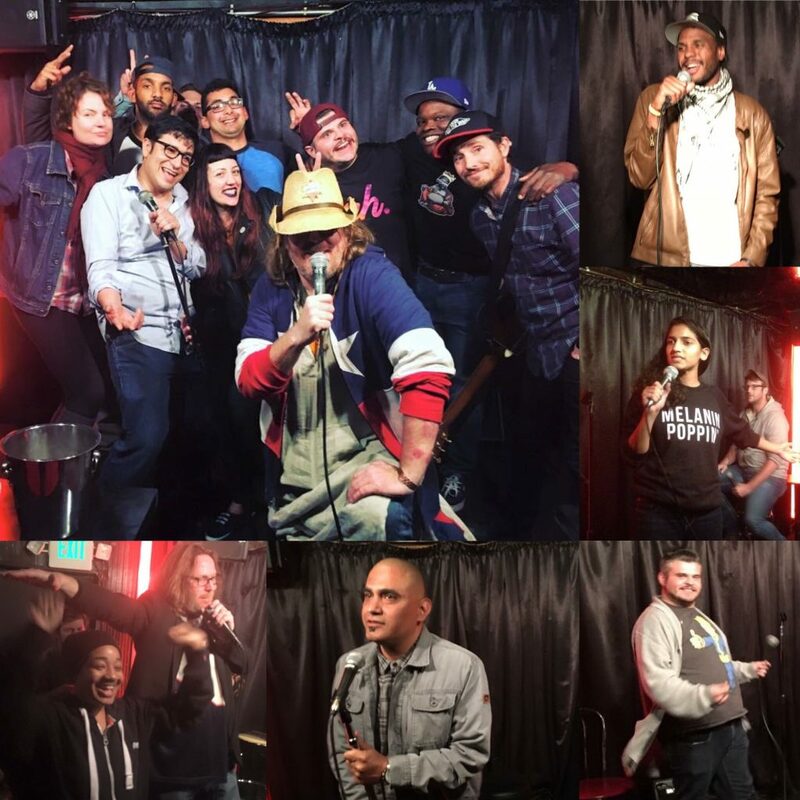 So yeah, I went from hanging out at an open mic at the Comedy Store to Co-producing it. So how’d you get that? It wasn’t something that was given to me. I saw an opportunity to pitch in and I pitched in and I kept showing up, pitching in more and things organically worked that way. And if the current team of myself, Erik Marino, Sarah Kenny and Mark Stevens on sound makes it to late July/August, it’ll be a full year we all came together and rolled up our sleeves and kept the show running on the rails. That one night in July it was like the Avengers coming together with Erik Marino as both Captain America and Loki rolled into one. 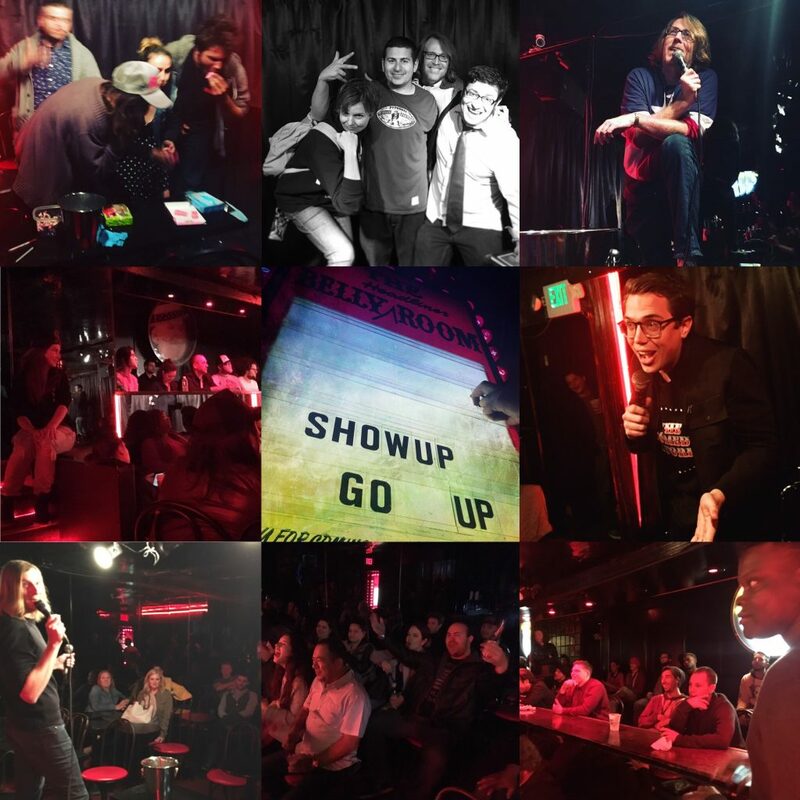 Show Up Go Up LA returns to The World Famous Comedy Store June 18th, 2017 10:30pm! And I busted my lip while doing a good deed. While helping a lady change her tire at the gas station, I busted my lip in the same spot I had stitches. They forgot their tire iron, I wasn’t in a hurry and so I decided to give my tire iron a try and it worked. Well except for that last lug nut. So I did the logical thing. I stepped on my tire iron with one leg and use my body weight to push it down. Nope, no movement, none at all. It supported my full weight. So I did the next logical thing and stood on it with both legs, still no movement. So logically I started jumping with both feet on the tire iron. 123.. Nope. 123.. Nope.. 1..2. And bam! I ended up busting up my lip. The tire got changed. She paid for my gas before I could slide my card in the machine. Not a bad way to start a day. Note to self, be more careful and try not to get myself killed again. How I am still alive and not missing any(more) body parts is beyond my comprehension. It’s good to be back at Rudyard’s to reconnect with some good friends like Slim Bloodworth and Warren Wright. Slim Bloodworth killing it at the last guest spot at the last night of the Houston Laff Stop. Warren Wright on a road trip to Cap City and the LBJ Museum in Austin Texas while passing a fire at a fireworks factory near the fourth of July. A bonafide “Dyke of Hazard”, Slim can out-drink, out-fight, out-cuss and out-joke any comic twice her size. She even came back from the dead after flatlining while on a gig in Ottawa, Canada. And she’s been a part of many more crazy times. Warren Wright is a frantic force of nervous energy balled up exploding onto insane laughs on stage and he’s also one of the hardest working characters off stage too. Not since Matthew Broussard starting his first year in stand up have I seen a comic rise so skillfully quick on stage by leaps and bounds. All around good people and phenomenal comics, what more can you ask for? Other than a Rudz burger and maybe a Shiner Bock or two. I have a history with Rudyard’s. It was the first room that I saw local Houston comics’ like Niki Key and Melissa Nichols take control of their careers and produce their own full comedy shows outside a club structure of any kind. People do it all the time, for me that blew my mind. Since then there have been so many moments at that Rudyard’s stage good, bad and in between. I cut my teeth on that stage, even learned how to co-book a show and promote one too. Even made the Houston Press’ Best Place For Local Comedy 2007. After the Laff Stop closed and before the current rise of local scene like The Secret Group it seemed like clubs were closing one after another and the Houston comedy felt kinda post-apocalyptic. Lots of talent either moving on, dropping out or just staying on the road and holding onto what little they had left. 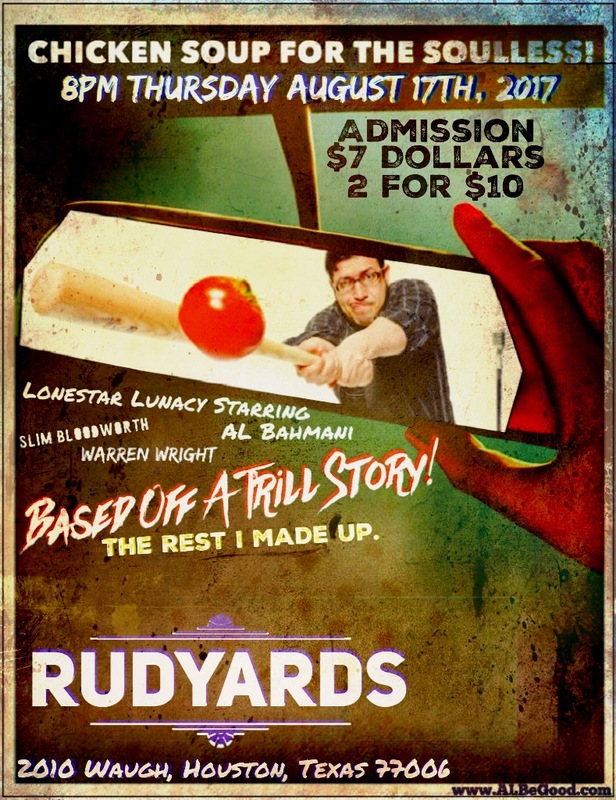 Eventually, Kevin Farren resurrected comedy at Rudyard’s after Sherlock’s Pub on West Gray closed its doors in and inner loop Houston lost another local comedy hub after the Laff Stop closed its doors in ’09. 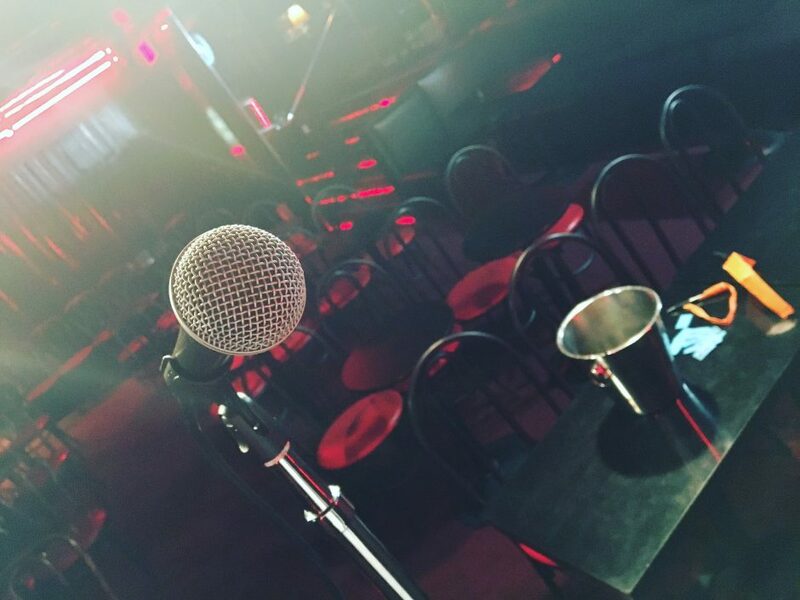 Local comic, Dusti Rhodes currently runs one of the best mics on Monday night at Rudyard’s and for more that a couple of years it’s currently still one of the best stages for music and comedy in Houston on any night. 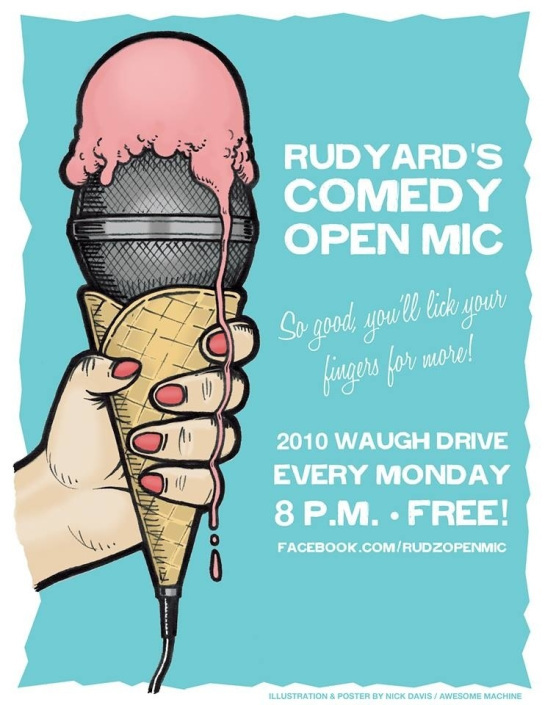 If you’re in Houston on a Monday night, Rudyard’s Comedy Mic is definitely worth checking out. In other news, I designed a book cover! It’s weird looking something you whipped up in physical form. Second Edition available on www.m3publishers.com! 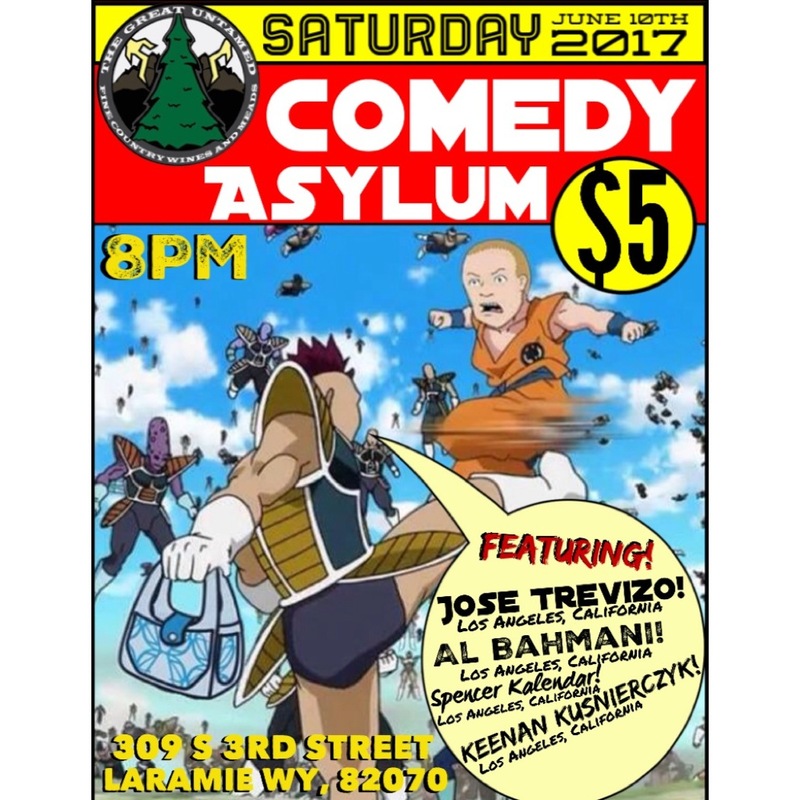 Right now I’m heading off to perform The Great Untamed in Laramie, WY with Jose Trevizo, Spencer Kalendar & Keenan Kusnierczyk! I’m a lucky man to make it this far. In the long run, it isn’t much to pile a hill of beans on but it’s my molehill and I had help. For starters, I get trusted to run other shows and not burn down the place when the regular host is out. I am thankful to those who keep me running around in multiple directions and keep building up things in different directions. I survive daily in part to friends, family, exes of days past and folks who find me not so bad a person to pass the time with. If I were to list them all would be a blog post in itself, still, thank you. Better to be in purgatory with good company than lonely in heaven. To still be here so far still feels like an achievement, even though at times it doesn’t feel so much.